Market study summary: A hard truth to swallow? 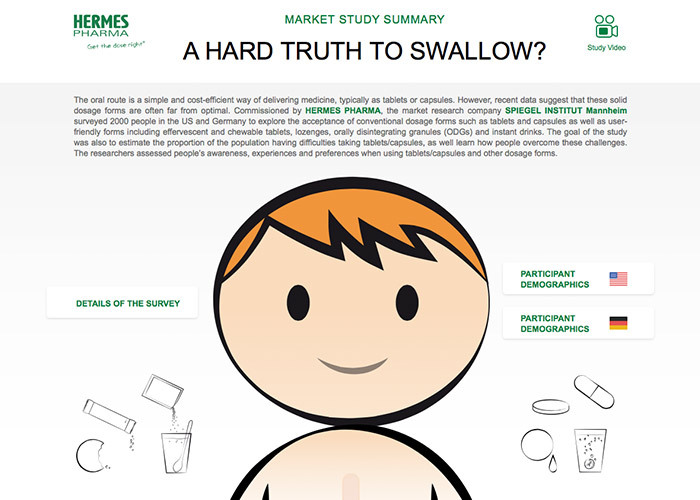 A market study „ A hard truth to swallow“, commissioned by Hermes Pharma, was carried out. It explores the prevalence of difficulties swallowing tablets and the role of alternative dosage forms. For this we designed and set up a B2B-campaign microsite. The real challenge was to take the plethora of information that is available and make it quick and easy for the user to understand while presenting it in a charming way. The result is a Storytelling-Onepage, that is far away from being „difficult to swallow“: many illustrations, animated graphics and charts present the results of the study in a very vivid and lively manner. All these features and the unique design add up to a most elegant composition and provide an upmost enjoyable user experience. This Onepage found also the W3 Awards jury´s approval and was honored with an award in the category Website/Animation.